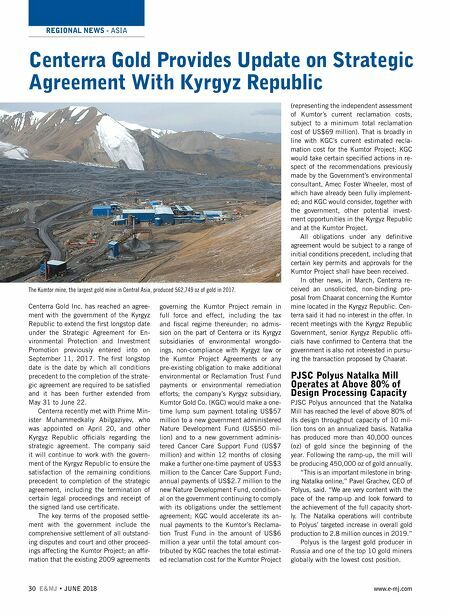 REGIONAL NEWS - ASIA 30 E&MJ • JUNE 2018 www.e-mj.com Centerra Gold Provides Update on Strategic Agreement With Kyrgyz Republic Centerra Gold Inc. has reached an agree- ment with the government of the Kyrgyz Republic to extend the first longstop date under the Strategic Agreement for En- vironmental Protection and Investment Promotion previously entered into on September 11, 2017. The first longstop date is the date by which all conditions precedent to the completion of the strate- gic agreement are required to be satisfied and it has been further extended from May 31 to June 22. Centerra recently met with Prime Min- ister Muhammedkaliy Abilgaziyev, who was appointed on April 20, and other Kyrgyz Republic officials regarding the strategic agreement. The company said it will continue to work with the govern- ment of the Kyrgyz Republic to ensure the satisfaction of the remaining conditions precedent to completion of the strategic agreement, including the termination of certain legal proceedings and receipt of the signed land use certificate. The key terms of the proposed settle- ment with the government include the comprehensive settlement of all outstand- ing disputes and court and other proceed- ings affecting the Kumtor Project; an affir- mation that the existing 2009 agreements governing the Kumtor Project remain in full force and effect, including the tax and fiscal regime thereunder; no admis- sion on the part of Centerra or its Kyrgyz subsidiaries of environmental wrongdo- ings, non-compliance with Kyrgyz law or the Kumtor Project Agreements or any pre-existing obligation to make additional environmental or Reclamation Trust Fund payments or environmental remediation efforts; the company's Kyrgyz subsidiary, Kumtor Gold Co. (KGC) would make a one- time lump sum payment totaling US$57 million to a new government administered Nature Development Fund (US$50 mil- lion) and to a new government adminis- tered Cancer Care Support Fund (US$7 million) and within 12 months of closing make a further one-time payment of US$3 million to the Cancer Care Support Fund; annual payments of US$2.7 million to the new Nature Development Fund, condition- al on the government continuing to comply with its obligations under the settlement agreement; KGC would accelerate its an- nual payments to the Kumtor's Reclama- tion Trust Fund in the amount of US$6 million a year until the total amount con- tributed by KGC reaches the total estimat- ed reclamation cost for the Kumtor Project (representing the independent assessment of Kumtor's current reclamation costs, subject to a minimum total reclamation cost of US$69 million). That is broadly in line with KGC's current estimated recla- mation cost for the Kumtor Project; KGC would take certain specified actions in re- spect of the recommendations previously made by the Government's environmental consultant, Amec Foster Wheeler, most of which have already been fully implement- ed; and KGC would consider, together with the government, other potential invest- ment opportunities in the Kyrgyz Republic and at the Kumtor Project. All obligations under any definitive agreement would be subject to a range of initial conditions precedent, including that certain key permits and approvals for the Kumtor Project shall have been received. In other news, in March, Centerra re- ceived an unsolicited, non-binding pro- posal from Chaarat concerning the Kumtor mine located in the Kyrgyz Republic. Cen- terra said it had no interest in the offer. In recent meetings with the Kyrgyz Republic Government, senior Kyrgyz Republic offi- cials have confirmed to Centerra that the government is also not interested in pursu- ing the transaction proposed by Chaarat. PJSC Polyus Natalka Mill Operates at Above 80% of Design Processing Capacity PJSC Polyus announced that the Natalka Mill has reached the level of above 80% of its design throughput capacity of 10 mil- lion tons on an annualized basis. Natalka has produced more than 40,000 ounces (oz) of gold since the beginning of the year. Following the ramp-up, the mill will be producing 450,000 oz of gold annually. "This is an important milestone in bring- ing Natalka online," Pavel Grachev, CEO of Polyus, said. 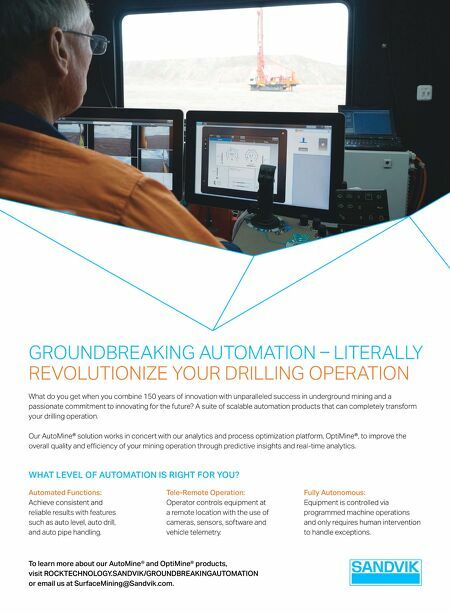 "We are very content with the pace of the ramp-up and look forward to the achievement of the full capacity short- ly. The Natalka operations will contribute to Polyus' targeted increase in overall gold production to 2.8 million ounces in 2019." Polyus is the largest gold producer in Russia and one of the top 10 gold miners globally with the lowest cost position. The Kumtor mine, the largest gold mine in Central Asia, produced 562,749 oz of gold in 2017.